My husband named this picture chicken eating cats. I think this is fitting because we cook chicken for them once a week. There favorite meal without a doubt. In this picture is Simon (14 months) is the long thin one by the stove, Pumpkin (17 years) is the long haired calico and Sophie (18 months) our special needs kitty is the other we call Sophie. She is an original Siamese cat. Simon is what they call a classic Siamese. Some call this Punky-poo aka Frau Foobsie or just Foobsie. 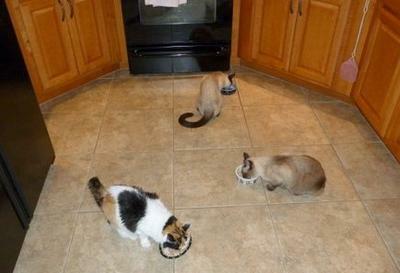 In this picture they are all scoffing away on home cooked chicken for cats. There favorite part of chicken day is the supervised chomping on bone ends and gristly stuff. The juicy drumstick tendons and meat is then mixed with some good Innova wet for extra balance. It makes the dinner of champions that goes for 2 days. They also get 500 mg of L-Lysine twice a day to keep their immune systems healthy.Next time I post a story here I’ve got to get some pictures of Simon the original Siamese cat zipping around especially with his toys. I’ve never seen nor had a cat like him. We spoke to his breeder last week she’s never seen it either. Although she has an 11 week old boy ready to go and he’s a daredevil like Simon trying to go as high as he can! When Simon was like around 11 – 12 weeks old he was racing around on the plant shelves 12 feet up in the kitchen leaping from one side to the other. He scared the crap out of me and unfortunately (or fortunately) he had fallen a couple of times so he stopped after a while. One time he tried to leap from top of fridge to the high up plant shelf he’d barely catch the top of the shelf with his paws and then he’d pull himself up. One time he didn’t make it and fell down to the top edge of the fridge where he bounced and hit the hard tile floor. I was a wreck but he was OK – no doubt sore – but OK. This has not stopped him though from running up to a wall and then leaping straight up 8+ feet or more. Or running like a maniac then hitting the wall about 5 – 6 feet up then RUNNING ON the wall for another 8 – 10 feet defying the laws of gravity. Is this normal for chicken eating cats or what.